Day 18: Why is this Homemade Utensil Pouch My Pride and Joy? 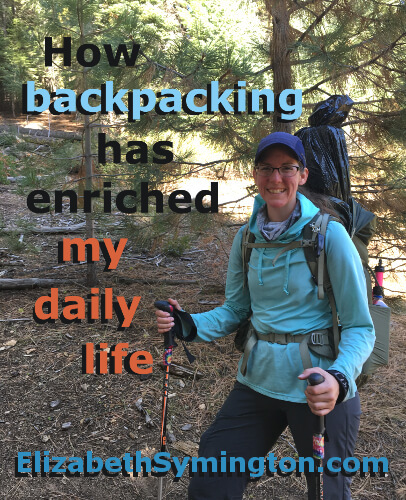 This is Day 18 of the 31 day series on “How backpacking has enriched my daily life.” I expected lightweight backpacking to be a hobby. Instead it has transformed me for the better. Sewing my own backpacking gear has introduced me to fabrics that I didn’t even know that existed, like dyneema and ripstop nylon. Using scrap nylon from a backpacking project, I sewed myself an orange utensil pouch for my purse. 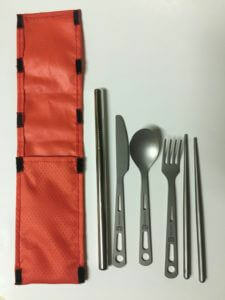 I love my utensil pouch because: 1) It is so much fun eating with my collapsible chopsticks, 2) It’s important to me to not eat with single-use utensils and straws, because I want to take care of our beautiful planet, and 3) I’ll never be without a spoon when I impulse buy a pint of ice cream! This utensil pouch is my pride and joy! I carry it with me everywhere I go! (The only exception is that I don’t take it backpacking, because I only hike with a spork.) I am so fanatical about this that I wrote a tutorial on How to Sew a Utensil Pouch. Please send me a photo if you decide to make one! I’d love to how you personalized it! I love the idea of keeping a spoon handy in case you impulse buy ice cream. Your utensil case is something I want to make or receive. And the colour is so happy. I think Mrs. Claus just might deliver you a beautiful utensil pouch for Christmas!